It was a few weeks ago that he wondered why his story had stopped just at the climax. And at the climax it came a phone call from Sgarbi, the famous italian art critic in person, not from someone of the secretary. "Hello Luigi, all right? How about coming to the Expo? I received a lot of requests but I want you and your masterpiece! "And so the story of Luigi Prevedel has added a new unexpected chapter: his statue welcomes visitors at the entrance of Trentino-AltoAdige restaurant, Eataly Pavilion, within the project "The Treasury of Italy", an exhibition curated by Vittorio Sgarbi. But let's start from the beginning, because the story is long and exciting. Luigi Prevedel, tiler carpenter originally from Castelfondo (TN), Val di Non, born in 1969, four years ago he was seized by an irresistible feeling of challenge to himself : with no experience in the field he suddenly decides, at the age of forty, to sculpt all alone a statue in marble. He has never seen a statue from the truth, beyond those depicted in books or the wooden ones admired several times in Val Gardena. In front of which he wondered yes, indeed, how they were created, fascinated by the secrets of their creative process without bothering to have them revealed. Those desires that remain in a corner of our mind and that develop slowly, without we notice it. And one day the desire comes out from the corner and takes shape, without waiting too much because waiting, says Luigi, you reason and no longer try. To produce something exceptional it is necessary a state of unconsciousness. And then, in just four days, from the idea he goes to the sketch, the design, the order of the marble to the quarry of Carrara. Because that desire of knowledge he wants to satisfy empirically alone, without asking anyone. Because the quarry of Carrara is low, the marble is sold only to the sculptors and Luigi, as told on the phone to the person who listened, the sculptor has never done. Moreover, he never picked up a chisel. But the first laugh does not let mortify. He continues to call, to contact persons... till he gets what he wants, a marble block of 60 tons. In the company of a friend he pick it up personally and after seeing it, in the return journey he was silenced. He did not do one of the usual madness things that peolpe do in their forties , he has not thrown in jogging or took a plane for a trip out of season. He has invested tens of thousands of euro in a marble block that does not know which way to take. For several months he leaves the block of marble in the abandoned barn that a friend loaned him as a deposit. And he seized by fear if not despair, and the comments and ratings of the villagers who know him well and know his family , wife and ten years old girl, does not help him. And the emotional boost that usually leads artists to create, or love or passion or curiosity about their own subject, does not seem to be crucial in this case. Prevedel has no urgent desire to communicate something, does not want to see immortalized in marble the object of his desires, simply he wants to challenge himself. Stefano Zuech (Brez -Trento 1877 1968), the sculptor who decides to portray, is a pretext, he chose him because his artistic legacy is rooted in Trentino, in his land, his sculptures are in Brez as in Rovereto. And then an eventual success of his work would tie the statue and his name to Trentino, he feels very much a part of this region. But nothing more, so that the idea is casually leafing through a book dedicated to him and choose as a reference picture front, having to invent then hips and profile. After nine months the mood strikes. He tries, but the tip of a bricklayer who began to use can not even hack it, the marble, bouncing and falling on the floor. Luigi goes really bad time, sleepless nights, overwhelmed by doubts but always encouraged by his father who did not stop believing in him. The work will stop at least three times for fear, doubt, momentary blocks. But in 14 months of work and four years from the effective day of the decision finally he get to see the finished work. But before. Before he has to spend nights and nights in the barn where the block is left having no alternative deposit, given the size of the bulky marble. Before he has to suffer the cold with temperatures reaching minus 17, first to warm up he has to come down several times in the stable to get his hands on the belly of the cow, because the temperature of the marble comes down to - 25, before he has sto face sculptors respondents humbly for tips, telling him to stop. Before it has to overcome moments of crisis and doors in the face and punched on the teeth, as told by his colorful language, to respond to the jeers of the villagers and of certain artists who do not believe in neither he nor the marble used. Before he has to do the psychologist of himself, because for such a business you must achieve and maintain a balance incredible. First he has to overcome strong physical pain, the arm, the fingers, the whole left side of his body. Before he must even fear that he risked his life, the estimation of family that for years see you in a way and then suddenly discover you in another way. But finally the day comes in which he finishes his statue, in front of which the nephew of Zuech will get even crying with emotion, exclaiming he is my grandfather! There comes a day when the veil is removed from the statue placed in the seventeenth-century Arsio palace , the fraction of Brez from which came from Stefano Zuech. And an honorable, mauro Ottobre, passing by chance over there he is so shocked to think quickly to rush Vittorio Sgarbi, who will be impressed by the work and history of Prevedel, which he will compare precisely "a miracle", recognizing the soul and the hand of the artist. Once, Prevedel says he finally realized the technique of wooden statues of Val Gardena, and says his is different, unique, beyond any logic, and that he will take it secret. He did not write any notes because he remember everything, every step of his work, each centimeter carved into the statue. Which started immediately from the head, working upside down with a prospect so special, then move the foot with which he had to reconnect it in the following months. Stylistic choice that leaves a million ciance to get wrong, he tells still stunned. He never blank the statue, Prevedel, but always worked detail on detail with infinite precision, then not being able to see the fruit of his work until the end. The last five months he worked every day, abandoning his daily business. MEMENTO AUDERE SEMPER seems to remember the vision of the statue that expresses perfection and meticulous attention to detail, even if not everyone can find to have a creative genius as happened to him. Prevedel is amazed as all of us, but he is convinced that he still has another forty percent having worked to give to him to sixty. Because he has created perfectly just what he wanted without giving further limits ... that now he wants to take on with other jobs. But for the future of this genius surprised need a greater recognition, it is necessary that the statue turns Italy over the Trentino, it is necessary that his artistic talent is fed by the wonder of other visitors who would push to strongly believe in its potential, while time is still in disbelief and thoughtfully in front of his masterpiece. Where he wanted to put something of himself in the expression of the face: he does not know what he looks away, he does not know what to think, he does not know what it means because he has an open mouth that seems to convey only wonder. That amazement that an artist must always transmitt, as mentioned by Vittorio Sgarbi during his visit to the statue quoting the poet Giovanni Battista Marino (1569-1625). And then a new opportunità comes, to show his statue: the International Biennial of Asolo, edition 2014, an event that brings together four sections: painting, sculpture and installation, graphics, photography. Here, too, the obstacles are not few, most notably the size and weight of the statue, ten quintals concentrated in one square meter, which could jeopardize the floors of the Biennial rooms , the convent of SS Peter and Paul in the center historic. Danger that is dispelled by giving space to sculpture in front of the town of Asolo. Luigi Prevedel wins sculpture prize, confirming his talent at international level. On this occasion he receives compliments by Vangi Giuliano, a complete artist wellknown all round the world, and also an official invitation to attend in September 2015 at an art event in Korea, in Seoul. But in the meantime something has changed, as we have seen, and in September the statue of Luigi Prevedel will still be at the Expo under the eyes of visitors from all around the world. And then? 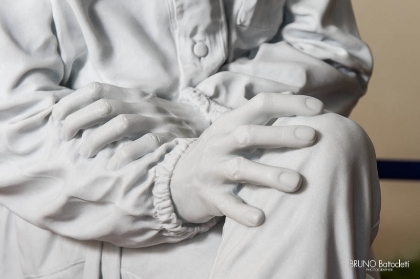 The artist for the moment wants to enjoy this Expo: "The important thing is being there, being able to show my statue to all the visitors who will come here, because being able to show to a wide audience it has always been my dream. Meanwhile I am making other sculptures ... We will see what it will happen! "